Although provisional, today’s statistics released by the ONS suggest that overall the UK economy remained flat in 2012: there was no growth. However, the statistics that point to a 0.3% contraction in the economy during the final quarter of 2012 are, when taking into account demographic factors, even more worrying, for the figures relate to aggregate GDP and not per capita GDP. Given the rapid population expansion that has taken place over the past decade and a half and continues to this day, per capita economic output is shrinking at an even faster rate. This conclusion would appear to be supported by statistics released earlier this week stating that unemployment is now at its lowest in 18 months and a new record has been reached for the number of people in work. Average earnings are said to have increased by 1.5% in the year to November 2012, but given that RPI throughout this period was running at more than double this rate, they purchasing power of average wages has been falling; our standard of living in these raw terms is declining. 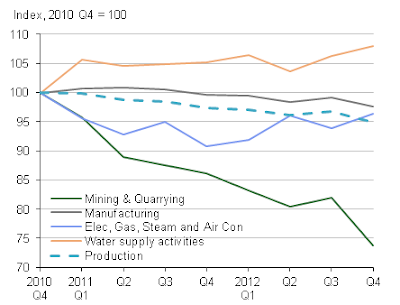 Worryingly, the underlying state of the economy looks weak, with the genuine foundations of wealth creation – “the production industries” – contracting at a faster rate than the economy as a whole, dropping by 1.8% in the final quarter of 2012. 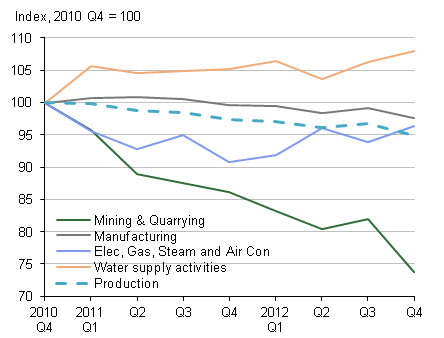 This represents part of an ongoing trend illustrated in the graph below, which shows that production as a whole had declined by circa 5% since the beginning of 2011, with the largest drop being witnessed in mining and quarrying which fell by over 25% during the same period. Clearly, the economic policy of the current Government is not working, and yet, the ‘solution’ offered by the Labour Party is no better, for it focuses upon maintaining consumption through increased borrowing without addressing the trade deficit and the over-reliance upon the service sector. A radical new industrial policy is required that provides greater backing for the development of cutting-edge technologies and the industries of the future, providing jobs both for those with high-level intellectual skills in science and engineering, as well as for those working in support roles in the supply chains required to nurture and sustain this domestic revival. However, such an approach is at best paid only lip service by the globalist parties of today: Conservative, Labour, Liberal Democrat and UKIP. A new non-globalist alternative is required to provide the support and impetus necessary to launch and sustain a long-term economic revival with a vision and programme that looks decades into the future, rather than simply to the next General Election. Very well-articulated, Durotrigan. Manufacturing industry provides REAL wealth for a country. Finance and services are essentially parasitical in comparison (particularly finance) and only small countries like Switzerland and tax havens like Monaco can live off them. Our economy is now totally unbalanced so it should come as no surprise to learn that it is bumping along the bottom at best and that our longterm growth rate is so poor. Germany, Japan and South Korea understand that you need a vibrant manufacturing base to provide a strong core for your economy around which service industries are built. We also used to understand this but since Mrs Thatcher was elected we have fatally forgotten this essential truth. UKIP is a part of the problem and not the solution with their globalist, Thatcherite economic stance and therefore we desperately need a non-globalist and electable nationalist party to come into existence. The BNP has imploded and Griffin seems to think gay-bashing is the way to bring-in the votes judging from his twitter ramblings. He is, of course, wrong in believing that. I have no doubt a new credible nationalist party takes a longtime to come into existence in order to get the foundations right and to deter anti-gay nutters from joining to take just one example yet this new rumoured party never seems to see the light of day so when will it show its face? I am getting increasingly dissilusioned at the state of nationalist politics in Britain and wonder if the moment a credible party will gain real support has now passed us by? Thank you Anonymous. I share your concerns and must apologise as ever for delays. Those of us who work full time have busy lives, and a number who once in theory proffered their support would appear to have drifted off to an emergent fringe-related entity. From now until Sunday I have no time whatsoever, but hope to post something then that should clarify matters. Where we go from here very much depends upon the active goodwill of readers. As for the economy, worse is better. Much worse is much better. If you want change, people need to experience hardship. Thanks GP. As for "worse is better", I suppose that that ultimately depends upon the subsequent course that people head down, and that, to a great extent, will depend upon what is available politically at the time.